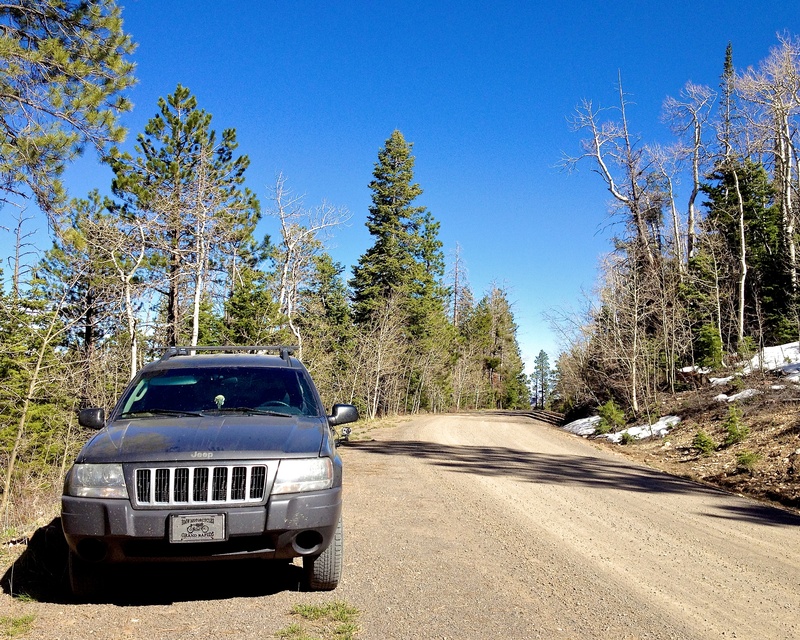 I woke up the second morning spent in the Jeep to a beautiful, sunny blue sky. I didn’t have a set plan for where we would go, just in the general direction of Escalante via UT-12 and my favorite, The Hogback. Using the Jeep as a “camper’ instead of the tent makes for easy take-down – just had to load the cooler and chair back in, tidy up the site a bit , feed the beasts and we were on our way! 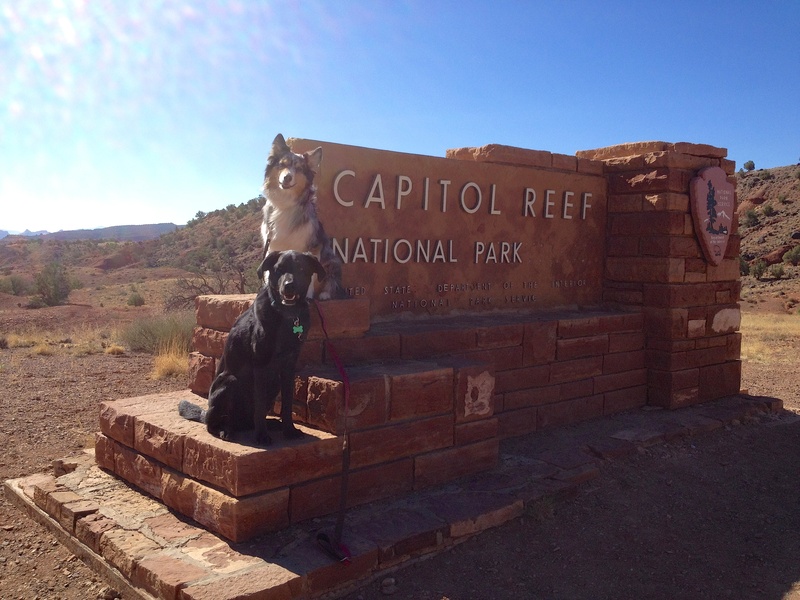 South on UT24, our first stop would be Capitol Reef National Park. While researching, I came across a loop on my Utah Recreational Map that mentioned Temple of the Sun/Temple of the Moon in Cathedral Valley. After researching on the internet, I planned on driving the loop and camping in Cathedral Valley for the night. I stopped at the visitor center in Fruita and asked about conditions on the road and decided against it. Back to the Jeep, I noticed an amazing Overland vehicle with European plates and started chatting with the couple standing outside. 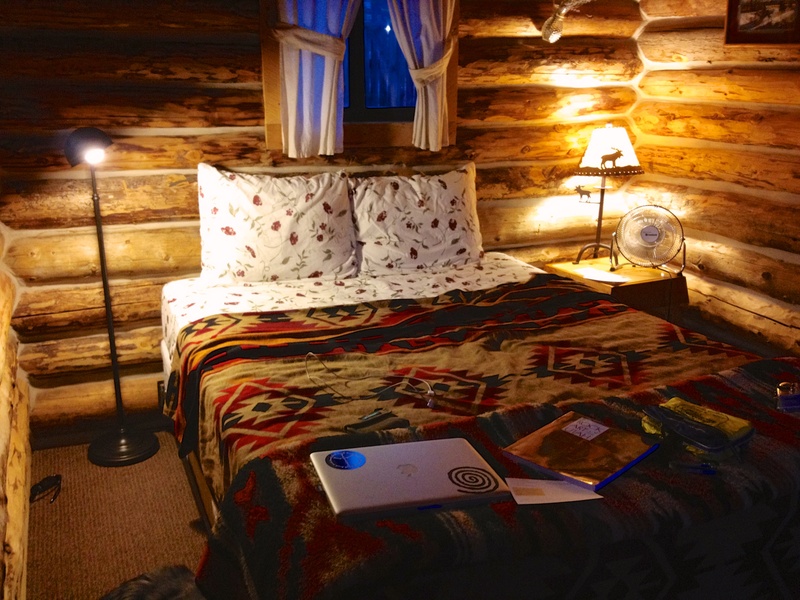 They were from Amsterdam and were traveling around the world in their van…pretty awesome setup! I quickly checked out the campground that was near the visitor center, it was quite full and sites were close together so I opted to keep rolling, stopping for a couple of photos in front of the Capitol Reef National Park sign. After a quick stop for Subway (a staple meal on this trip) in Torrey, we set off down UT12 toward Boulder Mountain. The last time I was on Boulder Mountain was September 2011 near the end of a 3 week long motorcycle trip. Part way up the mountain I was pummeled with dime sized hailstones, not very comfortable on a motorcycle! The weather this time up the mountain was much sunnier, albeit windy, and we made stops at each of the Boulder Mountain overlooks. 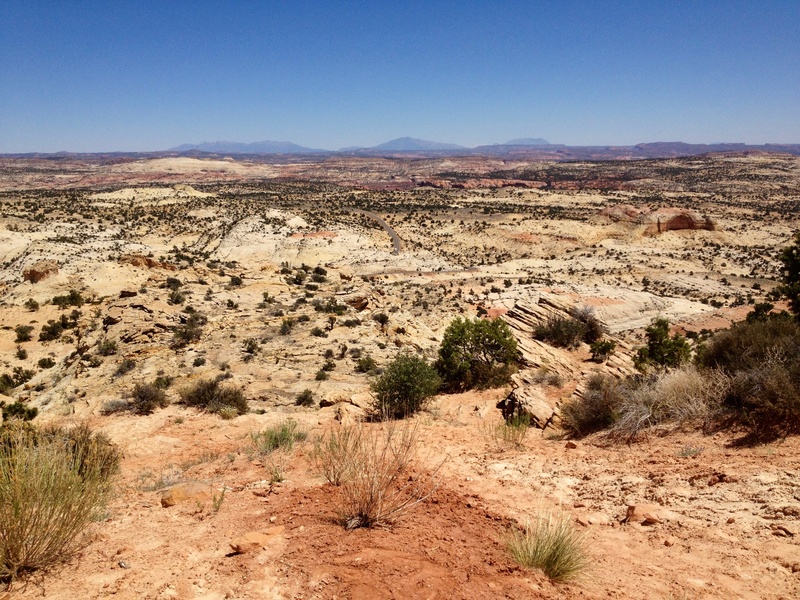 We kept heading west toward Escalante and the Hogback, a stretch of UT12 that sits atop a thin ridge of sandstone wide enough for the two-lane road, with dropoffs on each side. This is an amazing ride on a motorcycle, one of my favorites, unless you get stuck behind a motorhome. 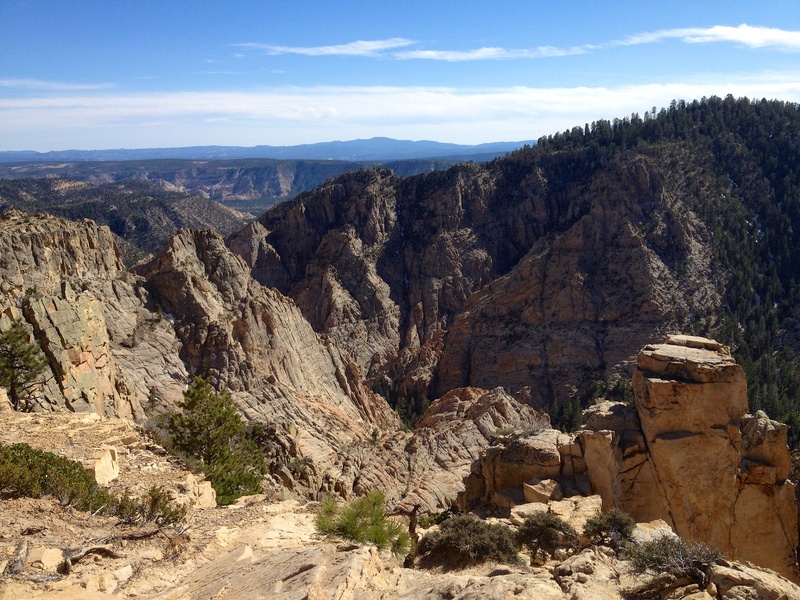 We took a moment to walk around Head of the Rocks view point, an overlook over Escalante Canyon and vast stretches of slickrock with UT12 winding its way through. 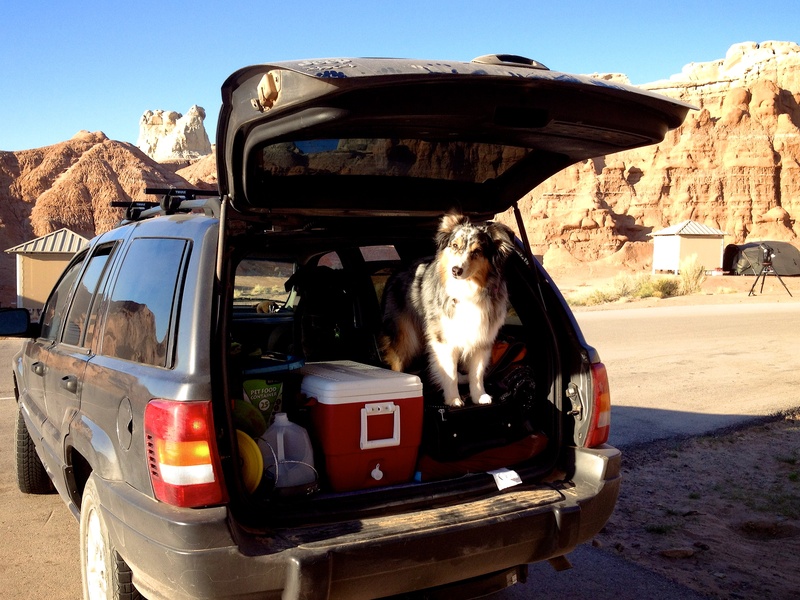 Upon arrival in Escalante, I looked for established campsites but everything was full. 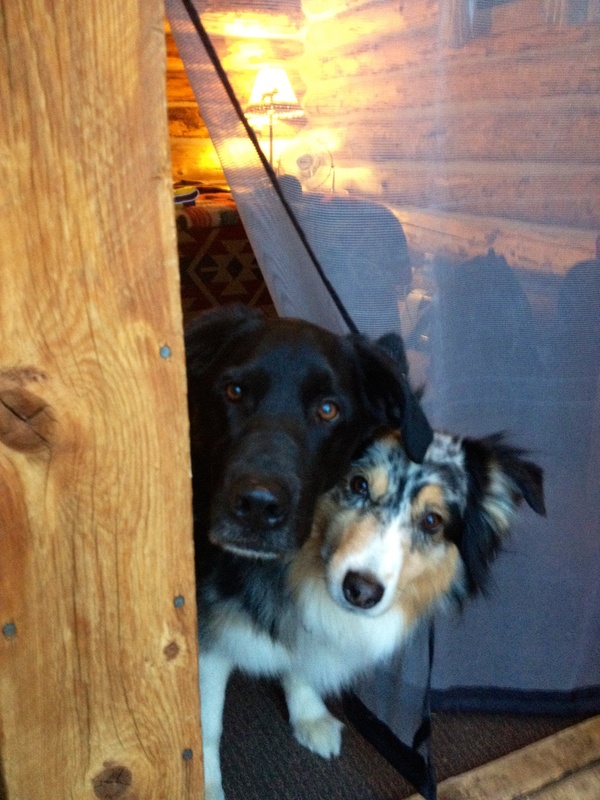 New to dispersed camping, I didn’t consider that at the time and ended up in one of the pet-friendly cabins at Escalante Outfitters. The dogs were quite hot due to the unseasonably warm weather so I asked at the desk if there was an area to take the dogs swimming. 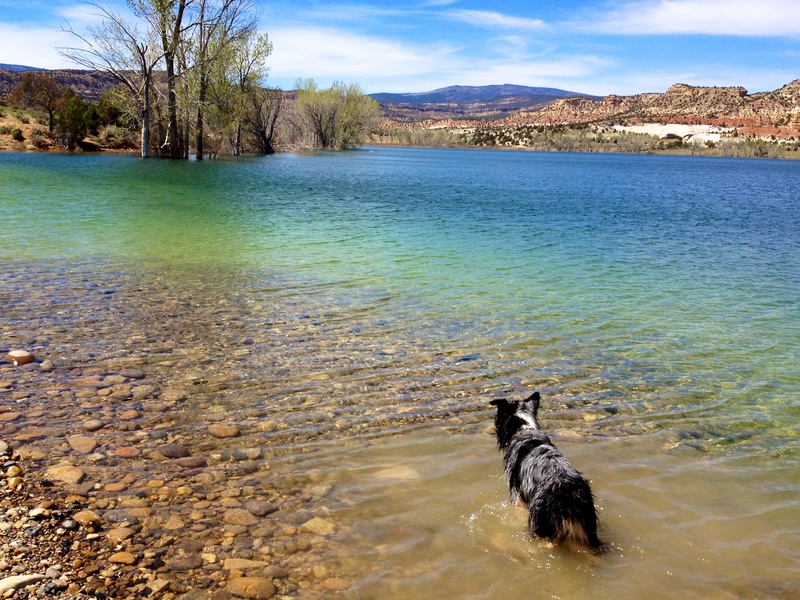 I was directed to Wide Hollow Reservoir, a body of water formed by a dammed Escalante River. The dogs were in their glory (especially Yukon) splashing around in the cool water. Unfortunately, this outing ended any hope of hiking for the rest of the trip as Mira pulled up her rear leg with a torn pad. 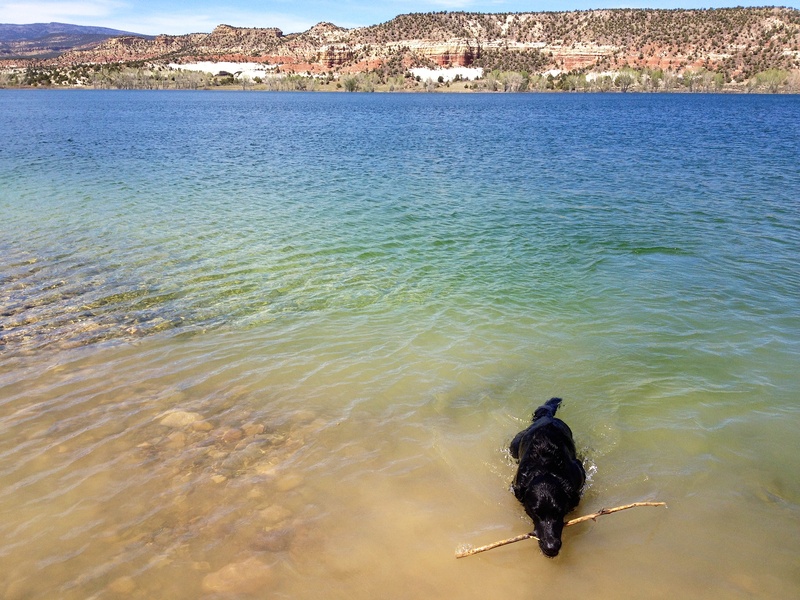 Yukon bringing back his stick – blissful at being in water again! Due to the circumstances, I took the opportunity to drive Hells Backbone Road instead of the hike I had planned to Calf Creek falls. I had been wanting to check this road (and its famous bridge) out for a while but always arrived in town with too little time to do so. 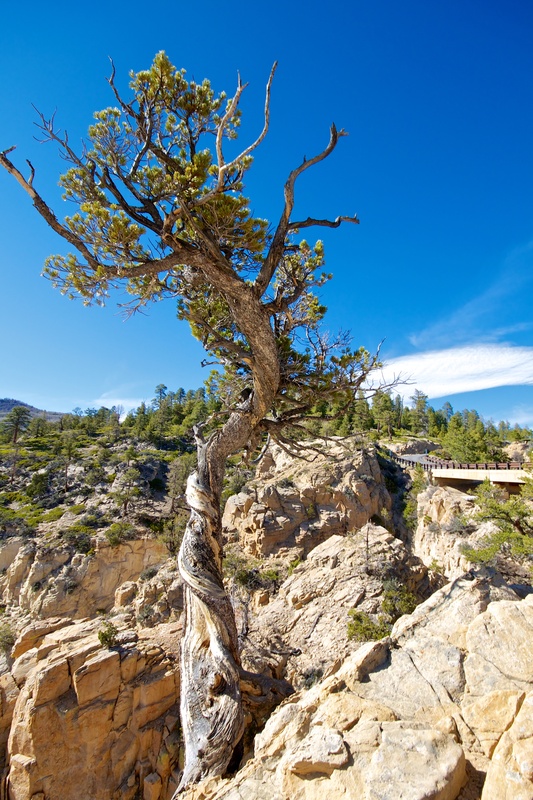 Starting out in Escalante, I wound my way through a juniper covered desert landscape which made way for pines and aspen as the road climbed its way to a higher elevation. We stopped near Pine Creek to play in the snow and wade in the ice cold water before arriving at the historic Hell’s Backbone Bridge. While climbing around the rocks near the bridge and taking in the stunning view of the Box Death Hollow Wilderness Area, I noticed another vehicle slowly making its way across the chasm. The brown Chevy pickup, bearing a ‘Beaver Island’ license plate, pulled behind the Jeep – a fellow Michigander perhaps? An older man, in his late 70s as I would come to find out, stepped out of the cab and came over to say hello. 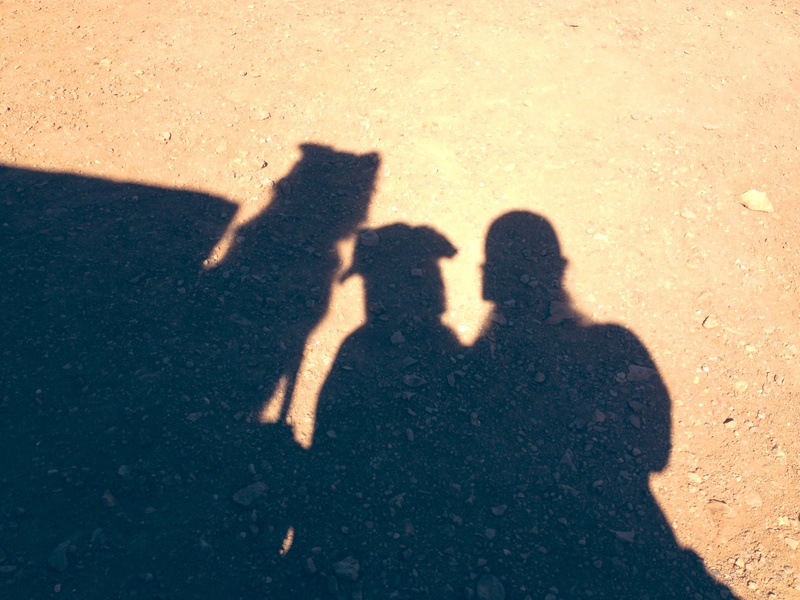 He was touring around Utah, camping in his truck on what he called his last big trip, though judging by his spryness I suspect there will be many more trips in his future. As I suspected, he was indeed a Michigan native, a resident of Whitehall, a mere hour north of me. Though I’m an extroverted introvert, one of my favorite parts of road trips is the people met along the way. This gentleman was no different, I thoroughly enjoyed our conversation and after 20 minutes of story swapping, he was off to his campsite for the night. 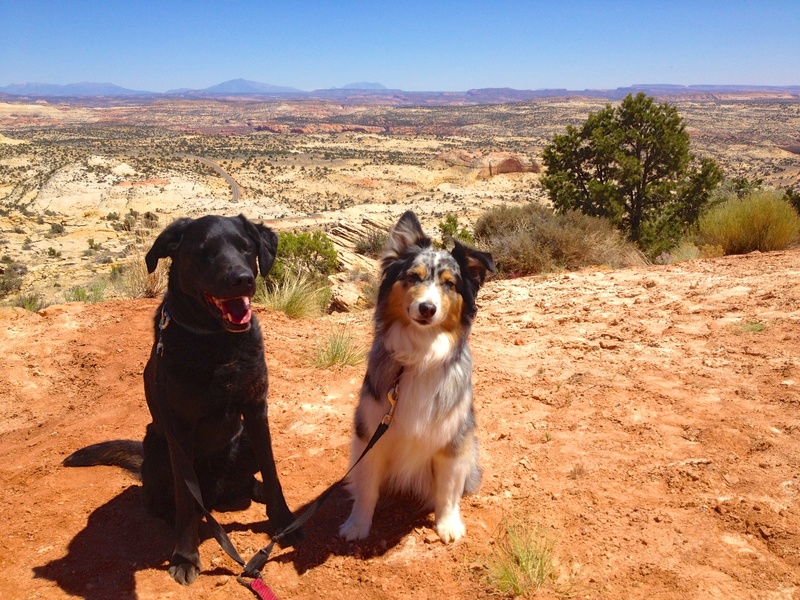 The dogs and I continued exploring around the bridge before heading back to the Escalante Outfitter cabin.